Surrounded by walls with 6 km lengths and situated on 10 hectares of a peninsula, Castle of Alanya hosted Hellenistic, Roman, Byzantine, Seljuk and Ottoman civilizations. 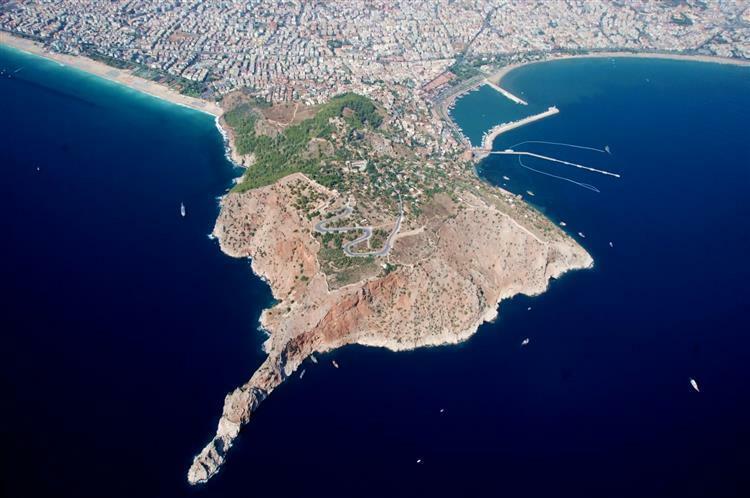 Unknown about its history of establishment and by whom to found, geographer Scylax from 4th century BC mentioned Alanya as Coracesium at first. Strabon defined Coracesium as the first apparent city if came from west to Cilicia and specified its location on a very steep rock. Coracesium by convenience of its natural defense and its sheltered port even with a small military became a harbor and center of the piracy in 2nd century BC, ideal for pirates and rebels. Hellenistic wall with large block stone and mortar, found in the part of the Middle Castle (Orta Kale) from Arap Evliyası to Ehmedek, remained from period of Diototos Tryhon, who was the ruler of the city in 2nd century BC. In 65 BC, pirate dominance ended with Coracesium war, which resulted the victory of Roman Pompeius. The city in Roman time grew by expansion of walls and addition of new buildings. In this period, coins were created in the name of emperors. Samples of coins can be seen in Alanya Museum. Alanya Castle in Byzantine time with the name of Kalonoros (the beautiful mountain) became a location point for sailors and the busiest port of the Mediterranean. Church in the castle (İçkale), Arap Evliyası, ruins of monastery at Cilvarda point and remains of round – towered wall continued from Middle Fortress (Orta Hisar) to the castle (İçkale) belong to Byzantine period. In 1221, Kalonoros was assigned to Alaeddin Keyqubad I, Anatolian Seljuk Sultan, by Kyr Vart, a former owner of the castle and its name was changed as Alaiye. Alaeddin Keyqubad I began big construction activities, solidified old walls, built new walls and gave the golden age to Alanya. 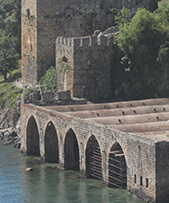 Today’s existing walls, large cisterns, shipyard, Red Tower, Cannon House, Akşebe tomb and palace complex in the castle (İçkale) are some of the works built by Alaeddin. Ehmedek, Akşebe Small Mosque, Andızlı Mosque, Seljuk and Lower Castle (Asagi Kale) Baths were constructed during Seljuk’s time. 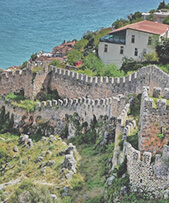 By gaining Alanya, Anatolian Seljuk sultanate had a strong castle in coast of the Mediterranean as well as a strong foundation in both the sea and the land. 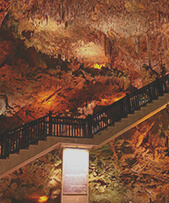 Alaiye reached a specific status in developing internal, external and transit trade. Alaiye in the first half of the 14th century remained among important cities of Anatolia and the Mediterranean by an essential naval base as a leading commercial city of Anatolian Seljuk and as a center of trade and shipbuilding by a strong relations with Egypt and Syria. Mostly Egyptian merchants who came for famous cedars used in the construction of the ships as well as Genoese, Venetian and Florentine merchants bought spices, canvas and sugar. Pegolotti in his “practura della mercatura” book introduced a table for weights and measurements used in Alanya with Italian in comparison. Egyptian and Syrian merchants were traveling to the Black Sea ports via Alanya. Alaiye felt into the Kingdom of Cyprus for a short period after the collapse of Seljuk Sultanate (1293) and then came under the dominance of Ottoman after Karaman and Alaiye principality (1471). Süleymaniye Mosque, covered market with Ottoman bazaar at Upper Castle (Yukari Kale) and traditional Alanya houses are monuments of Ottoman period. Alaiye in Republican period took its name at request of Mustafa Kemal Ataturk, who visited the city. 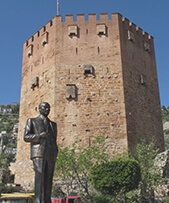 Many local and foreign travelers mention about Alanya Castle. In 1332, Ibn-i Batuta stated export of timber to Alexandria, Damietta and Egyptian cities; in 1650s, Katip Çelebi noted growing cotton, silk and sesame by comparison of Alanya Castle in point of its magnificence with the Baghdad Castle; and in 1671 Evliya Çelebi expressed that there were three hundreds houses, Süleymaniye Mosque and Akşebe Small Mosque, a cistern, houses without patio in the Middle Fortress (Orta Hisar), two madrasas, six schools, three khans, one bath, one fountain and one hundred fifty shops at the Lower Castle (Asagi Kale), all streets having steps and Access provided by mules and donkeys. Setton Llyod in his Ala’iyye book separated Alanya Castle as five (5) regions by segmentation of walls. The first region is as a shape of crescent, which its one end is Red Tower and another one the shipyard; second is the lower pitched part of the hill above the first region; third is region of Ehmedek and its extending area to Castle (İçkale); fourth region is Castle (İçkale) and fifth is regions except Cilvarda point.